What is irritable bowel syndrome (IBS)? What causes this condition? Irritable bowel syndrome (IBS) is a chronic functional gastrointestinal disorder, diagnosis of which is based solely on symptoms. Despite the fact that the symptoms of IBS are frequent, the gastrointestinal tract remains undamaged. In the past this syndrome had a number of names including spastic bowel, nervous colon, spastic colon, and mucous colitis. The underlying causes of this disorder are believed to be both mental and physical, though no direct cause was found, which is why it is classified as a functional gastrointestinal disorder. Irritable bowel syndrome can present itself in a number of subtypes depending on the patient’s usual stool consistency. It is important to differentiate between these subtypes in order to choose the right treatment. IBS-C (IBS with constipation) – watery stools no more than 25% of the time; hard stools more than 25% of the time. IBS-M (Mixed IBS) – both hard and watery stools happen more than 25% of the time. IBS-U (Unsubtyped IBS) – both hard and watery stools happen no more than 25% of the time. Problems with brain-gut signals – the large and small intestine are controlled by the signals coming from the brain. Problems with these signals may cause malfunctions in the motor function of the gut, causing pain or discomfort. Gastrointestinal motor problems – people with irritable bowel syndrome usually have abnormal motility of the bowels. Fast motility causes diarrhea, while slow motility causes constipation. Fast motility often causes strong muscle contractions, resulting in abdominal pain. A number of people with IBS might also experience hyperreactivity characterized by a very strong bowel contractions as a response to eating or stress. Hypersensitivity – people with IBS often have a lowered threshold for the pain. 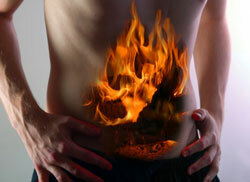 Thus, the normal stretching of the bowel, which occurs as a result of gas or stool, can cause discomfort or even pain. Mental health problems – problems with mental health including post-traumatic stress disorder, depression, anxiety, and panic disorders are common among people with IBS. However, it is yet unclear how one causes the other. It is believed that people who suffered from past sexual or physical abuse tend to express their psychological stress via physical symptoms. Bacterial gastroenteritis – a number of people with bacterial gastroenteritis develop IBS. It appears that damage to the lining of GI tract can be the cause of IBS. However, not all people with bacterial gastroenteritis develop irritable bowel syndrome. Small intestinal bacterial overgrowth – is an increase in the number of bacteria (or change in their type) in the small intestine. This can lead to gas production, weight loss and diarrhea, and sometimes lead to IBS. Due to this, in some cases antibiotics work well in treatment of IBS. Body chemicals – a number of studies have found that reproductive hormones may affect the clinical picture of IBS. For example, young women during menstrual periods have more symptoms, than throughout the rest of the month. Also, post-menopausal women experience fewer symptoms than women who still have periods. Food sensitivity – symptoms of IBS are often triggered by food that is fatty and spicy, as well as by coffee and alcohol. However, food sensitivity is in no way connected to the food allergy. Researchers believe that symptoms of IBS can be triggered by the poor absorption of carbohydrates and fats. Genetics – it is unclear whether IBS is passed down from parents to children. Studies have shown that there is a higher chance for people to develop IBS if their family members have a history of gastrointestinal problems.